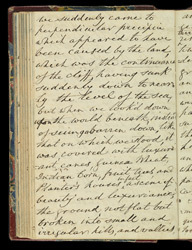 This is an extract from the journal of Sir Henry Martin, and is taken from the entries for February 1837, when he was in Barbados. Martin met the Hon. J. R. Best and was given a tour of his estate (known as Bateman's estate). He describes the great house, the viaduct, the gardens and the works buildings. Best also took Martin to a high peak on the estate from which they could see across a fertile valley to the Atlantic Ocean. Martin writes of the view in his journal, ? ?when we looked down upon the world beneath, instead of seeing barren down, like that on which we stood, it was covered with luxuriant canes, Guinea Meat, Indian Corn, fruit trees and Planter's houses, in fact a scene of beauty and luxuriance? ?